This example shows how to use Simulink® to model a quadcopter, based on the PARROT® series of mini-drones. To manage the model and source files, it uses Simulink® Projects. 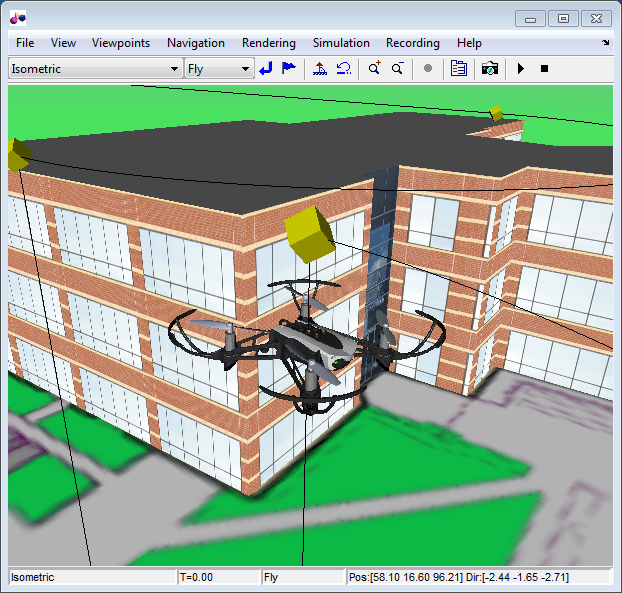 To show the quadcopter in a three-dimensional environment, it uses Simulink® 3D Animation. For the collaborative development of a flight simulation application, it provides an implementation of the Flight Simulation application template. This example works with the Simulink Support Package for PARROT Minidrones. Note: To successfully run this example you must have a C/C++ compiler installed. The quadcopter body axis is centered in the center of gravity. The x-axis starts at the center of gravity and points in the direction along the nose of the quadcopter. The y-axis starts at the center of gravity and points to the right of the quadcopter. The z-axis starts at the center of gravity and points downward from the quadcopter, following the right-hand rule. We assume that the whole body works as a particle. The file vehicleVars contains the values for the inertia and mass. Rotor #1 rotates positively with respect to the z-axis. It is located parallel to the xy-plane, -45 degrees from the x-axis. Rotor #2 rotates negatively with respect to the body's z-axis. It is located parallel to the xy-plane, -135 degrees from the x-axis. Rotor #3 has the same rotation direction as rotor #1. It is located parallel to the xy-plane, 135 degrees from the x-axis. Rotor #4 has the same rotation direction as rotor #2. It is located parallel to the xy-plane, 45 degrees from the x-axis. This example uses the approach defined by Prouty and adapted to a heavy-lift quadcopter by Ponds et al. The controllerVars file contains variables pertinent to the controller. The estimatorVars file contains variables pertinent to the estimator. The example implements the controller and estimators as model subsystems, enabling several combinations of estimators and controllers to be evaluated for design. An Inertial Measurement Unit (IMU) to measure the angular rates and translational accelerations. A camera for optical flow estimation. A sonar for altitude measurement. The example stores the characteristics for the sensors in the file sensorVars. To include sensor dynamics with these measurements, you can change the VSS_SENSORS variable in the workspace. The models implement several Aerospace Blockset™ environment blocks, including those for atmosphere and gravity models. To include these models, you can change the VSS_ENVIRONMENT variable in the workspace to toggle between variable and fixed environment models. The model uses the trimLinearizeOpPoint to linearize the nonlinear model of the quadcopter using Simulink Control Design (R). To make sure that the trajectory generation tool works properly, the example implements a test in the trajectoryTest file. For more information on how to do this, see the Simulink Control Design documentation). Using the flight instrument blocks. Toggling between the different visualization variant subsystems. You can toggle between the different variant subsystems by changing the VSS_VISUALIZATION variable. Note that one of these variants is a FlightGear animation. To use this animation, you must add a FlightGear compatible model of the quadcopter to the project. The software does not include this model. 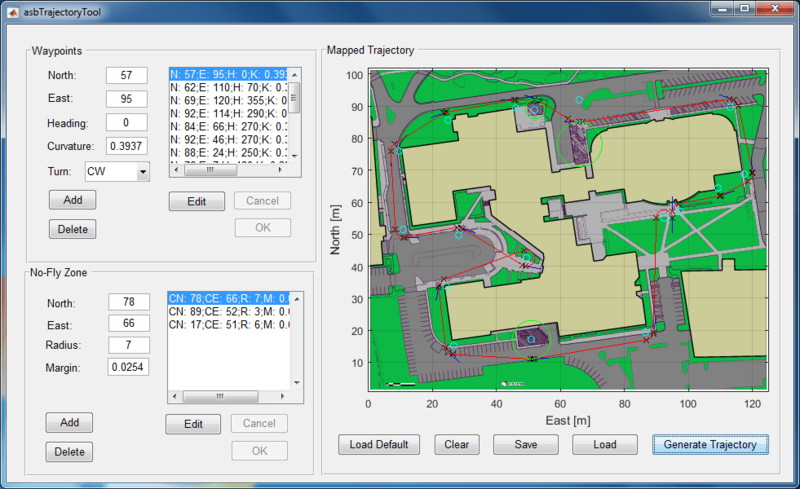 A trajectory generation tool, using the Dubin method, creates a set of navigational waypoints. To create a trajectory with a set of waypoints this method uses a set of poses defined by position, heading, turn curvature, and turn direction. A list of poses appears in the waypoint list to the right of the text boxes. To add a waypoint, enter pose values in the edit boxes and click Add. The new waypoint appears in the waypoint list in the same panel. To edit the characteristics of a waypoint, select the waypoint in the list and click Edit. The characteristics of the waypoints display in the edit boxes. Edit the characteristics as desired, then click OK. To cancel the changes click Cancel. To delete a waypoint, in the waypoint list, select the waypoint and click Delete. Use the Add, Delete, Edit, OK, and Cancel buttons in the same way as for the Waypoints panel. This panel plots the trajectory over the Apple Hill campus aerial schematic based on the waypoints and no-fly zone characteristics. To generate the trajectory, add the waypoint and no-fly zone characteristics to the respective panels, then click Generate Trajectory. To save the trajectory that is currently in your panel, click the Save button. This button only saves your last trajectory. To load the last saved trajectory, click Load. To load the default trajectory, press the Load Default button. To clear the values in the waypoint and no-fly zone panel, click Clear. The default data contains poses for specific locations at which the toy quadcopter uses its cameras so the pilot on the ground can estimate the height of the snow on the roof. Three no-fly zones were defined for each of the auxiliary power generators, so in case there is a failure in the quadcopter, it does not cause any damage to the campus infrastructure. The red line represents the trajectory, black x markers determine either a change in the trajectory or a specific pose. Blue lines that represent the heading for that specific waypoint accompany specific poses. No-fly zones are represented as green circles. Note: For visualization reasons the 3D representation of the quadcopter is not at the same scale as the environment. Prouty, R. Helicopter Performance, Stability, and Control. PWS Publishers, 2005. Ponds, P., Mahony, R., Corke, P. Modelling and control of a large quadrotor robot. Control Engineering Practice. 2010.